Jamie Oliver is on a mission to change the way we cook, in a good way. He wants us to eat well and make better choices in the food shops and in the process improve our lives and the world we live in. 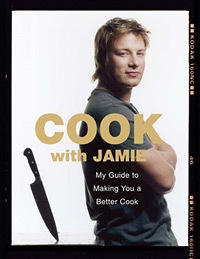 And, with Cook with Jamie, his 7th book he gives us no excuses not to. 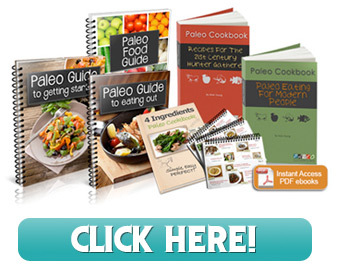 Consider it your good food/good cooking manual or your all purpose cookbook with a conscience. Jamie’s approach in Cook with Jamie is to break down the meal and dishes into manageable components and teach some basic techniques to build upon. While not a groundbreaking approach, what works here is his informal and honest writing style; he’s right there with you giving you the how’s and why’s in a fun and engaging manner. He chats with you about the food giving you just the information you need. Also, the clean layout and accompanying photographs, including some particularly useful step by step shots, of both finished dishes and trickier techniques (such as making homemade pasta) are an ideal compliment to his writing and his style of cooking – up close, personal, fresh and real. Cook with Jamie starts off with basics of Salads. First he gives a primer on what makes a salad, then a bit about dressing and ideal ingredients and combinations for toppings along with a half dozen classics such as Lemon Oil Dressing; Creamy French Dressing; Grilled Chili Dressing and making your own mayonnaise. He then moves into recipes from the basic Simple Crunchy Salad; Simple Green Salad; Greek Salad to more adventurous warm salads such as a Middle Eastern Duck Salad. This general format is repeated and expanded upon in sections on Pasta & Risotto; Meats (including how to be a better shopper; cuts of Beef; how to cook Meat); Vegetables (Baked Potatoes Stuffed with Bacon, Anchovies and Sage) and Desserts (top tips for making cakes and Family Favorites). A good solid collection of classics and new favorites from a reliable and inventive source. One wonders where such a busy celebrity chef and entrepreneur finds the time to compile such an exhaustive and informative collection – we applaud him for his energy, enthusiasm and pure dedication to good cooking. Hi, Cook with Jamie is his most recent and I think best yet all around cookbook – especially for new cooks or those wanting a general cookbook. Lots of great basic recipes and suggestions for variations on those basics. Good for everyday or get togethers. P.S. glad you like the site, thanks for visiting. Hi Carol—I’ve been wanting a Jamie Oliver book for awhile, never quite sure which one I should get, but this is it. Thanks for the recommendation. I like the new format of the web site. Good choice Natalie, glad you like it. His next book, Jamie at Home due out in April looks fantastic too – lots of great food and tips from his garden. This is my favorite J.O. book, so far. Cheers, Michelle.